The MagSafe power adapters that ship along with Apple MacBooks have a removable AC Plug, called “duckhead”. The primary purpose of this AC Plug is portability and the ability to support different types of AC Plug when traveling overseas. But the traditional AC Plug supplied by Apple fits into the adapter in such a way that the plug sticks out along its width. Hence, when it’s plugged into the wall socket, it fits in vertically, taking up more space than it ideally should. 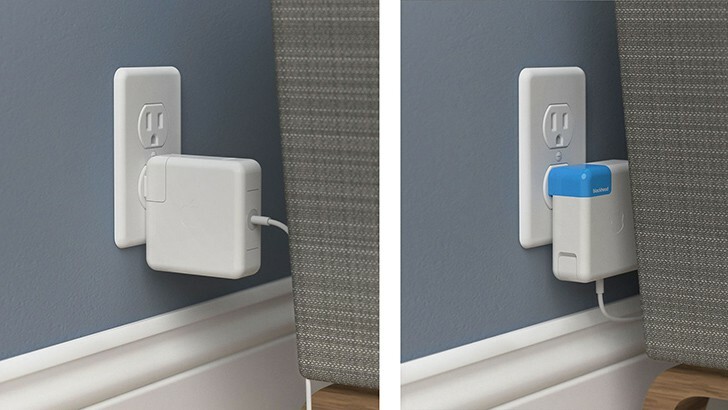 Blockhead is an innovative AC plug that slides into Apple power adapters in such a way that you can plug them sideways into the wall socket. This solution evidently takes up less space, and helps you to plug your power adapter in various places, which might not have been possible with the traditional plug. It is the ideal “duckhead” that Apple should have supplied with your MacBook in the first place. In addition to saving space, Blockhead’s design also directs the power cord attached to the adapter at a more natural angle and protects it against possible stress conditions. Plugging the adapter sideways also makes the arrangement more stable, reducing the adapter’s possibility of falling out of the wall socket. The Blockhead Plug is compatible with all currently available MacBook power adapters, and even supports all 10W and 12W iPad chargers. It can be purchased from the official website, TenOneDesign, for $19.95 (single piece) or $34.94 (for two Blockheads). If you have anything to say about the product, do let us know in the comments below.